Sarah Darville The vacant space at 130 St. Marks Place. Talk about no rest for the weary. While most Community Board 3 committees are taking the month off, the SLA and DCA Licensing committee will meet on August 20 to consider 45 different businesses seeking approval for new or modified licenses to sell alcohol. Some of the highlights include a liquor license renewal of UCB East, which has a complaint history, according to the board. The new owners of Lakeside Lounge — soon to be Blackburn — are scheduled to appear before the committee, as expected. 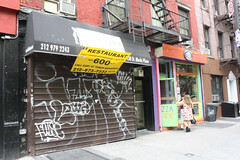 A new business is bound for 130 St. Marks Place; an employee at Whole Earth Bakery next-door told The Local that rumor has it that it will be a sushi joint. (Take this with a grain of salt, Sushi Lounge is only a few doors away at Avenue A). The space had been vacant for close to a year. 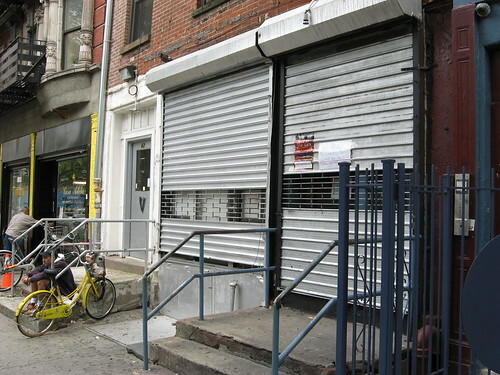 Members of Community Board 3 just voted overwhelmingly to recommend a denial of Heathers’ application to renew its liquor license, heeding the complaints of residents who earlier told the board’s SLA committee that the bar is a noisy nuisance. Supporters of the bar — mostly employees and customers — were left dumbstruck as only one member of the board voted in favor of the 13th street watering hole. Heathers’ ultimate fate will be decided by the State Liquor Authority at a later date. Have you seen the bus stop sign on St. Marks Place that seems to have been hacked down like an old oak tree? If not, Neighborhoodr has some fun photos. “No Standing” indeed. In other news, the fire department had an early wake up call this morning. 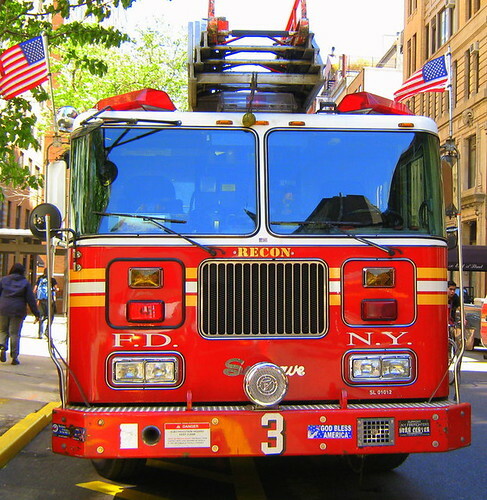 DNAinfo reports that a minor fire broke out at 5:43 a.m. at 40 Avenue D. It took firefighters 30 minutes to control the blaze on the eighth floor. No one was hurt and the cause of the fire is being investigated. Finally, after the closing of Banjo Jim’s was delayed, the staff of the bluegrass, jazz, and Americana bar has now announced (per EV Grieve) that Monday is the final day of business. As you know, new owner Rob Ceraso is converting the space into an artisanal cocktail bar. Meghan Keneally The transfer was approved for Banjo Jim’s. 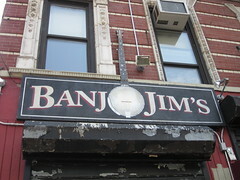 The State Liquor Authority Committee of Community Board 3 Monday night endorsed the transfer of the liquor license at Banjo Jim’s, the popular bluegrass bar on Avenue C.
The transfer of the bar’s liquor license was said to be the only issue left to be resolved before the bar was sold to an ownership group led by Robert Ceraso. The next step is for the Community Board to pass along its recommendation to the State Liquor Authority. The new license allows for acoustic guitar accompanied by microphone amplification and DJs up to two times per week. The hours will remain the same as they are at Banjo Jim’s currently — 5 p.m. to 4 a.m. throughout the week, and then from noon until 4 a.m. on the weekends. Few other details were finalized at Monday’s meeting, except that the signage will change — perhaps unsurprising since Mr. Ceraso has indicated that he will depart from the bluegrass theme and opt for an “artisanal” motif, which may not fit with the large banjo on the current sign over the bar’s front door. The bar’s new doors will be barn-style with glass windows that can be lifted and opened in the summer months. 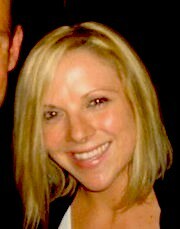 Meghan Keneally. 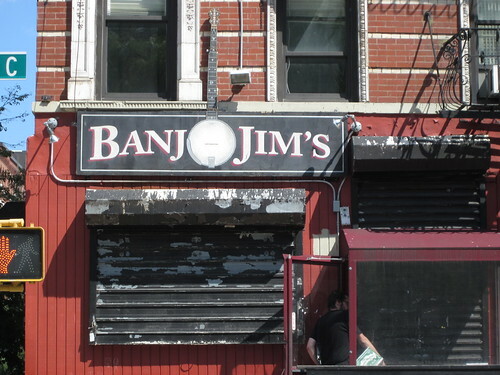 A staple of the East Village music scene, the future of Banjo Jim’s is up for approval. After the blogger EV Grieve reported that changes may be coming to Banjo Jim’s, a popular bluegrass bar on Avenue C, locals took to their keyboards and headed to the blog’s comments section in anguish. The bar’s prospective owner, Robert Ceraso, told the blog that he will be presenting a plan to the State Liquor Authority Committee of Community Board 3 tonight asking that the liquor license for the bar be tranferred to he and his partners. In describing his vision for his bar, Mr. Ceraso said that he envisioned it as an “artisanal neighborhood cocktail bar.” And that did him in. Commenters skewered his use of the word, likening it to buzzwords of trends past, and immediately branded him as one of the big bad developers swooping in to discard the East Village of old. Mr. Ceraso said that the reaction was not totally unexpected. It’s going to be hot outside today, so if you get too warm just know that all Manhattan public pools have opened. Yes, that means, in about an hour, you can go jump in that pool at Tompkins Square Park. Or, if that’s too crowded, try the Dry Dock Playground and Pool on East 10th Street. Remember though, the pools are open from 11:00 a.m. to 7:00 p.m., and they do a daily pool cleaning between 3:00 p.m. and 4:00 p.m. If you shop regularly at the Super Saving Store on 14th Street and Third Avenue, it’s time to make your final selections. Our friends over at EV Grieve report that the store is closing soon. The store is known for selling groceries, health care products, school supplies and clothing all under one roof. Speaking of roofs, there’s a new historic landmark just south of our neighborhood — the Hardenbrook-Somarindyck House located at 135 Bowery. DNAinfo reports that the Landmarks Preservation Commission approved the house and two other buildings during its meeting on Tuesday. The commission also voted to schedule a public hearing for two East Village historic districts: a 300-building stretch from East Second and East Seventh Streets between First Avenue and the Bowery and 26 buildings along East 10th Street between Avenues A and B, DNAinfo says. 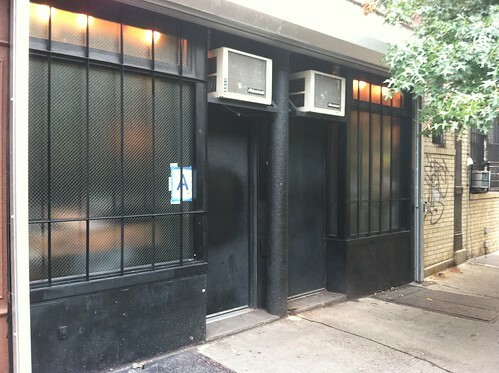 Oh, and just in case you missed it, Community Board 3 denied a liquor license to a new music spot at 34 Avenue A. The music spot, already labeled Piney Woods, is a project by music curator Todd Patrick and longtime East Villager Phil Hartman. Laura E. Lee Board members at a recent meeting. After a contentious two-hour discussion in front of more than 100 people, the licensing committee of Community Board 3 took no action regarding a liquor license for Piney Woods, a proposed venue at 34 Avenue A. No majority emerged during three votes on potential resolutions so the committee turned the matter over to be considered by the full board. The venue is the work of Todd Patrick, an indie music organizer commonly known as Todd P., and Phil Hartman, Two Boots Pizza owner. Mr. Hartman also owned Mo Pitkins, a venue at the same address that closed in 2007. The space ultimately became the bar Aces & Eights in 2009. Tensions ran high among the crowd gathered for the meeting at the Green Residence on East Fifth Street. At one point, chatter from audience members prompted Alexandra Militano, committee chair, to scold the spectators for “heckling” when opposing viewpoints were presented. In his opening remarks, Mr. Patrick said the space would bring back some of the neighborhood’s musical and cultural history lost to gentrification. “We are looking to be a place that harkens back to what brought us all to this neighborhood in the first place, which is the quality artistic legacy of this community,” he said. Laura E. Lee Participants at tonight’s meeting. The State Liquor Authority Task Force of Community Board 3 approved a resolution tonight that clarifies the terms under which liquor licenses can be transferred when bars and restaurants are sold in the East Village. The action, which will go to a vote of the full board at its next meeting, allows for “grandfathering” — a process in which the buyer of a business is allowed to assume the license owned by the seller, provided that the business had its license prior to June 28 and other criteria are met. Before tonight’s meeting, it was unclear how policy changes enacted by the full community board in February would affect applicants who requested a “grandfathered” transfer. The “grandfathering” provision is not used by other community boards, according to Susan Stetzer, the district manager of Community Board 3. But Community Board 3 allows businesses to apply as transfers, provided they meet other criteria like being deemed responsible business owners — a status evaluated by a review of liquor authority reports, police violations and complaints to the 311 city services information hotline. Natasha Dillon thinks she’s boring — but that’s not really the case at all. Earlier this month, Borough President Scott Stringer announced the newly appointed selections to Community Board 3, which covers the East Village, Lower East Side and parts of Chinatown. Ms. Dillon, a 26-year-old East Villager and gay rights activist, was one of these new appointees, after previously serving on the board as a community member. And while some insist that this crop of new appointees seems rather eclectic, Ms. Dillon insists that she’s actually quite boring. As a financial consultant, who’s currently working on a master’s degree in investment management from Pace University, Ms. Dillon seems like the average young East Village resident, except this activist and founder of a local East Village advocacy group, Queer Rising, has been arrested four times in the last year for her public actions for marriage equality in the United States. Her most recent arrest came earlier this month, after a group of Queer Rising members blocked traffic near Governor Andrew Cuomo’s Manhattan office on Third Avenue for nearly 10 minutes. However, Ms. Dillon has a somewhat different, slightly less radical, agenda for the East Village. Serving on the economic development committee, her main concern is to bring life back to local businesses — and to the East Village. Ian Duncan A passerby inspects South Brooklyn Pizza’s liquor license notice. 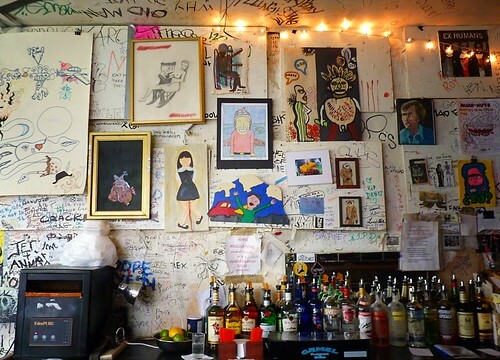 Despite the hurdles of entering a thoroughly saturated market, owners of bars and restaurants are still flocking to the East Village – and filing applications for liquor licenses. This weekend, the Post reported what we all kind of knew anyway. The East Village has more places to buy booze than any other neighborhood in the city: 474 in the 10003 zip code by their count. Cue mass eye-rolling in the blogosphere at the non-news. Concerned by the profusion of bars, Community Board 3 and the authority have started to toughen up. Last month, the board narrowly voted down a liquor license application for a Mexican restaurant run by Two Boots Pizza owner Phil Hartman and music promoter Todd Patrick. The reason for the proliferation of bars hinges on zoning technicalities and what critics say was the State Liquor Authority’s past trigger-happy attitude to handing out licenses. That created momentum and now entrepreneurs are desperate to get a foothold in the neighborhood, despite the obstacles. Next Monday, 33 businesses will put their case for new or expanded licenses to the community board. In a bold step, the owners of South Brooklyn Pizza labeled the community board “infamous” and urged their customers to sign a petition supporting their application. EV Grieve noted the claim, trigging much rumbling from the blog’s commenters. Ian Duncan Sutra lounge, owned by Community Board 3 member Ariel Palitz. Community Board 3 should be taking a rest from conflict. Last week, in a vote meant to end five months of debate, it finally passed a set of reforms to the way it makes recommendations about licenses to the State Liquor Authority. But bar owners who sit on the board are not satisfied and have vowed to challenge the new rules and investigate why they were banned from voting on the reform package. Shortly before last Tuesday’s meeting, a complaint was made against David McWater, a board member who owns three bars on the Lower East Side. Susan Stetzer, Community Board 3’s district manager, referred it to the city’s Conflicts of Interest Board. In a written response, COIB officials recommended that the three bar owners on the board be barred from voting on the reform resolution, as they had a direct financial stake in the vote. At the meeting, Ariel Palitz, a board member who owns Sutra Lounge on First Avenue at First Street, called the recommendation an “eleventh-hour attempt to gag” bar owners. Mr. McWater, who was recovering from a fall, was absent from last week’s meeting. Last week, we asked for your opinions on the recent decision by Community Board 3 to change the rules governing the transfers of liquor licenses when local businesses are bought and sold. “I know I’m not living in Iowa — nor do I want to — but walking home with them at 9pm on a Friday or Saturday is akin to showing them an R-rated movie. Additionally, living on 14th street, the amount of drunken noise, swearing, and fighting that comes through the window on those nights is appalling. 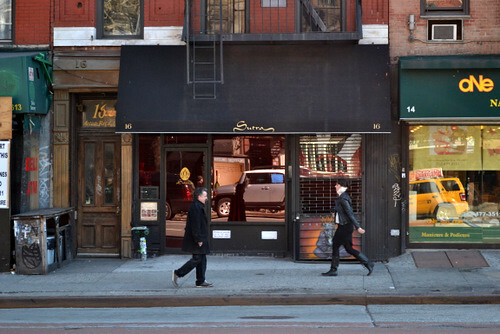 “Indeed, there are altogether too many dark storefronts east of First Avenue as it is. It’s optimistic to suppose that landlords will slash prices in the short-term to the extent required to attract Mom-n-Pop type low profit businesses. Join the conversation: What’s your take on the community board’s decision? Vivienne Gucwa A selection of bottles at Mars Bar. Earlier this week, Community Board 3 voted to amend the policies for transferring liquor licenses when local businesses are bought and sold. Save the Lower East Side said that the move “may be the most significant vote” that the board has ever taken. The blog theorized that the move might reverse a trend that has seen rents rise and created a dense cluster of bars in the neighborhood. We’d like to hear your thoughts about the board’s decision. 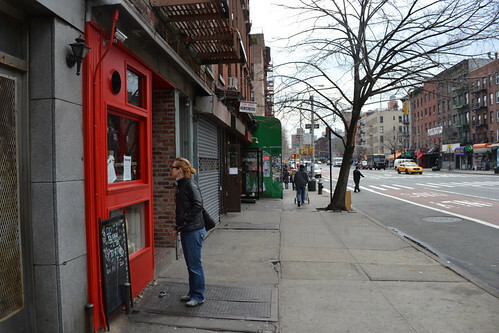 Is it a good thing that prospective bar owners may now have to think twice about coming to the East Village? Or are those businesses being unfairly targeted? Let us know. Put your response in the comments section below. 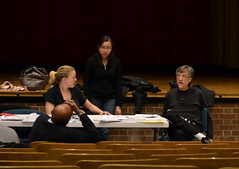 Ian Duncan Members of Community Board 3 debated changes to the liquor licensing process Tuesday night during a meeting at P.S. 20. Ending months of debate, Community Board 3 Tuesday night approved a sweeping overhaul of the way it makes recommendations to the State Liquor Authority for alcohol license applications. The vote ended five months of consultation and debate, some of it acrimonious, about the new policies, which are aimed at providing applicants with clarity and guidelines to follow if they are awarded a license. Much of the debate focused around so-called “transfers” or the ability to pass liquor licenses on to new owners following the sale of business. Bar and restaurant owners had argued this increases the value of the business and any moves to change the policy would hurt them financially. Under the policy adopted Tuesday night, the board’s State Liquor Authority committee will review transfers of licenses as though they are new applications. In the past they had been automatically approved. The committee does not have the final say over licensing decisions but passes on recommendations to the State Liquor Authority. East Village Election Issues from The Local East Village on Vimeo. In an Election Night appearance on NYU News, Suzanne Rozdeba, who covered the key local political races, discusses how neighborhood issues such as noise complaints, liquor licenses, bike lanes and pedestrian safety played a role in Tuesday’s balloting. Voters cast ballots for candidates in seven local races — three for U.S. representative, two for State Senate and two for State Assembly — and by overwhelming margins returned every incumbent to office. It’s hard enough to make it in New York, much less as a coffee house or cafe in a neighborhood where a basic search for “East Village, coffee” brings up 2,130,000 hits in .28 seconds. So many East Village cafes are trying to get a cup up on the competition by adding alcohol service to their menus. One could debate the merits of serving alcohol in a neighborhood already overrun by bars. But the recession prompted a spate of cafes to apply for a license to serve beer and wine in an attempt to separate themselves from the competition. (Hair salons and barber shops have also gone that route.) And longtime residents know that the cafe-plus-soft-alcohol model has worked in the East Village for years. Liquor License – Local East Village from Elisa Lagos on Vimeo. Liquor licensing is the hot topic in the East Village, with some residents railing against the noise and violence that they say booze brings. But cafe owners looking to put alcohol on their menus to make money said that applying for a license is a head-spinning process that often ends with them being painted as villains. Take the Case of Table 12, the 24-hour diner on Avenue A and East 12th Street. On Sept. 20, the liquor authority committee for CB3, which represents the East Village, refused to recommend Table 12’s application to the State Liquor Authority to sell beer and wine. On Sept. 28, the full board upheld the committee’s decisions on a number of East Village liquor license applicants, including the denial of Table 12. A brother of Table 12’s owner, who identified himself only as Tarik, said that the diner’s license application was submitted to help give patrons a “better dining experience” and also for the profit potential.